The Major Oak at Edwinstowe. As might be expected from the scarcity of medieval records and accounts pertaining to Robin Hood, there are very few structures which one could argue with any certainty as belonging to the legend. However there are many places which have acquired some form of association with the outlaw, an association which has frequently been formulated by local inhabitants or interested parties to benefit from the prestige which such a connection typically ensures. As the outlaw took hold in the popular imagination it became in vogue to name or otherwise attribute a host of structures to the legendary deeds of Robin Hood and his cohort. Although, as mentioned above, there is no clear-cut evidence to determine the setting of Robin Hood’s adventures, whether it be Sherwood, Nottingham or Barnsdale, it is Nottingham which has become popularly associated with the outlaw on a grand scale. Visitors to Nottinghamshire will find themselves in Robin Hood country, where the city council is using the international renown of the outlaw legend to promote the county’s heritage and encourage tourism. One will quickly encounter a variety of so-named streets, buildings and establishments; however, this is not a trend to be solely associated with Nottingham but can be seen across the country and worldwide. It is possible to conduct a tour of Robin Hood associated locations across the county; the BBC have created a virtual tour featuring Bestwood Lodge, Blidworth Cemetery (where legend tells Will Scarlet was buried), Robin Hood’s Hill, King’s Great Way, Lyndhurst, Newark Castle, Newstead Abbey, Nottingham Castle, Papplewick, Robin Hood’s Refreshments, River Leen, St Mary’s Church, Sherwood Forest, Southwell Minster and Robin Hood’s Stables. Nottingham Castle is referred to on numerous occasions within the ballads as the home of the Robin Hood’s arch enemy the Sheriff of Nottingham, drawing the outlaws to the town. Although a point of contention amongst some scholars, as there was at no point a Sheriff of Nottingham, rather a Sheriff of Nottinghamshire and Derbyshire and he certainly would not have resided at the Castle, the Castle is nonetheless forever associated with Robin Hood in the popular imagination. Capitalising quite rightly on this association, the Castle has hosted several related exhibitions, including a ‘Robin Hood Up Close’ exhibition exploring the recent television series. Similarly entwined with the legend is the church of St Mary’s at Edwinstowe where Robin is reputed to have married Maid Marian. Most famous of all however is Sherwood Forest. Whilst a forest is indisputably the home of the outlaw, which particular forest is the true setting of Robin Hood has yet to be conclusively determined. 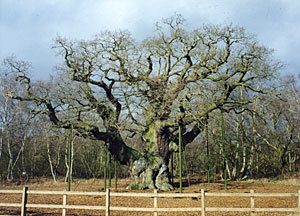 Sherwood Forest in Nottinghamshire is popularly accorded this prestigious position, but competition for its place comes from Barnsdale in Yorkshire, presenting a threat to Nottinghamshire’s claim on the outlaw. One can view Doncaster’s ‘Robin Hood Airport’ as an attempt to reclaim the legend, though one which seems unlikely to inflict serious damage in the near future. Here is a brief account of some of the key reasons for uncertainty: the Gest reads “Robyn stode in Bernesdale” and makes specific references to this area on several occasions whilst Sherwood is not specifically mentioned; numerous other references are made to places within the vicinity of Barnsdale, such as Sayles in the West Riding of Yorkshire and Kirklees Priory where our hero dies. Other ballads, including Robin Hood and the Monk do refer to Sherwood Forest however, whilst the presence of Nottingham itself in the tales is indisputable and what is more, there is some dispute as to whether there was actually ever a forest at Barnsdale. For more information on the links between Sherwood Forest and Robin Hood consult the Nottinghamshire County Council Website which contains useful information and history as well as links to events within the forest at: www.nottinghamshire.gov.uk/home/leisure/countryparks/sherwoodforestcp.htm. The freedom with which the outlaws appear to move between the two sites in the Gest, being in Barnsdale Forest in one scene and Nottingham in the next may suggest a lack of geographical knowledge on the part of its author. Alternatively it may indicate that two narrative traditions, one featuring the outlaw Robin of Barnsdale and the other centered around the Sheriff of Nottingham were at some point compiled together. Of course with the two sites located under 50 miles apart and Sherwood Forest extending as far as Worksop, approximately half way, it is possible to imagine that the outlaw simply did travel between the two as need dictated. Whatever the exact physical location of the forest, the ballads always portray it in much the same way, as an idyllic greenwood refuge in which injustice could not rear its head, where the day was always warm, the season always summer and the birds always sang; with this in mind perhaps any attempt to place the legend in an specific physical setting is somewhat irrelevant. A frequent trend which developed with the popularity of Robin Hood, apparently in conjunction with the romantic tendencies of the Victorians, is the naming of various natural landmarks and features with the pre-fix of Robin Hood’s, Little John’s etc. The prevalence of such sites is testament to the popularity of the legend, whilst an investigation into these names has revealed that none existed before the sixteenth century, marking the date from which the desire to link one’s heritage to that of the infamous outlaw began to exert its influence upon the landscape. Many of these names give Robin Hood powers better suited to a giant or mythical hero, such as Robin Hood’s chair in Cumberland and Derbyshire, Robin Hood’s table in Derbyshire and Robin Hood’s bed in Lancashire. M. R. Evans suggests that many of the place names which can be linked to specific outlaws adventures imply superhuman powers, as with Robin Hood’s Stoop at Hathersage in Derbyshire, which is said to be the site from which he fired an arrow into Hathersage churchyard 2,000 yards away; and two large stones in Northamptonshire, named Robin Hood and Little John, which are said to be two great arrows fired by the heroes which have since turned into stone. Similarly, so-named features are to be found in the forest, most especially Sherwood, with its close connections to the legend. Thus one can see Robin Hood’s oak, Robin Hood’s larder where the outlaw is purported to have hung venison on wooden hooks, but which sadly collapsed in the 1950s, and The Major Oak, which is also associated with the legendary outlaw, and whose venerable age makes it easy to believe that the outlaw hero and his band may have witnessed it in its youth. M. R. Evans, ‘Robin Hood in the landscape: place-name evidence and mythology’, in H. Phillips (ed), Robin Hood: Medieval and Post-Medieval (Dublin, 2005), pp. 184-7. The World Wide Robin Hood Society (http://www.robinhood.info/tourism/index.html) contains many details on places to see and things to do when in Robin Hood Country. A. J. Pollard, Imagining Robin Hood (London, 2004): an interesting discussion of almost every feature of the Robin Hood legend, including the physical setting of the tales. The Haunts of Robin Hood at http://www.highton.org/robinhoodold/haunts.htm also discusses the many structures associated with the outlaw, both in Nottinghamshire and Yorkshire.